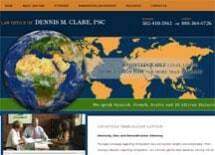 The Law Offices of Dennis M. Clare concentrates its practice in the area of immigration and nationality law. The firm represents clients before the United States Citizenship and Immigration Services (USCIS formerly the INS), Department of Labor, United States Information Agency, Executive Offices of the Immigration Courts throughout the U.S., and before U.S. Embassies and Consulates abroad. During the past thirty-five years, the attorneys with this office have served thousands of clients in immigration matters; the firm's clients include individuals and small companies as well as the leading multinational corporations of the U.S., Western and Eastern Europe, the Middle East, Far East, South America and Africa. Clients of the firm are located in or emigrate from every region of the world and more than one hundred and twenty (120) countries. The firm's attorneys are active in regional and national leadership of the immigration bar and have spoken on immigration and naturalization topics for professional, academic and public associations. We represent and advise our clients worldwide regarding all types of immigration and international business matters, including business and employment visas, and believe we have a reputation for prompt, professional service at reasonable costs.